All animals include walking and eating animations. 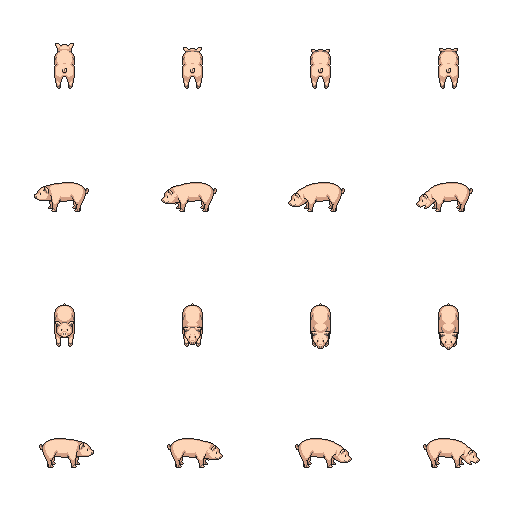 For every animal but the chicken, play the animation forward to start eating, then backwards to stop. Frames 3-4 can be repeated to have the llama/cow/pig/sheep eating for a while. Shadow images are included for the cow, llama and chicken. For the pig and sheep, the llama shadow can more or less be used, or modified a bit. 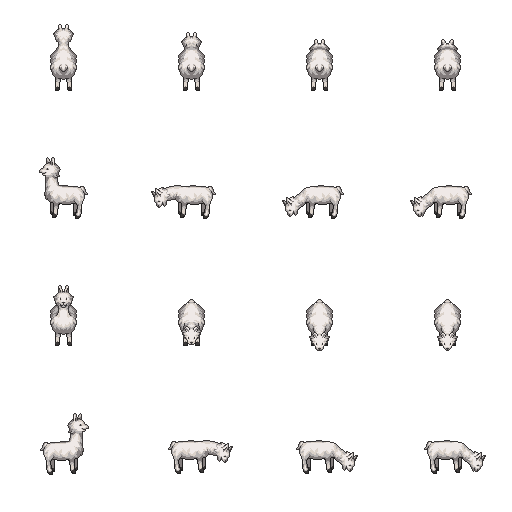 Update: added cow, and fixed some errors in llama files. 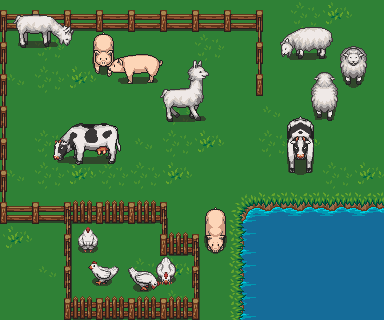 Also added some shadow image files, which can be placed behind the animals (one frame fits all). Also changed licenses to more lenient. (GPL2+ / CC-BY, instead of GPL3+ / CC-BY-SA). 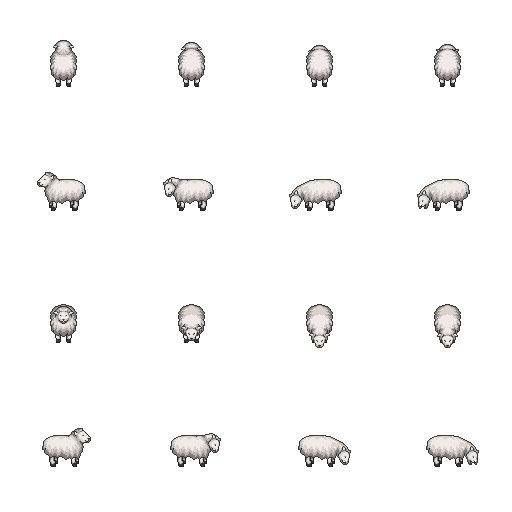 Also added pig and sheep. Attribute to Daniel Eddeland, and link to opengameart (preferably this submission). Awesome, please continue to do the others as well. Will there be a pig too? I'll be posting Commission for Dogs and cats soon. As for the pig, I hope we get one :) It all depends on daneeklu's time & interest. He's done great work so far! 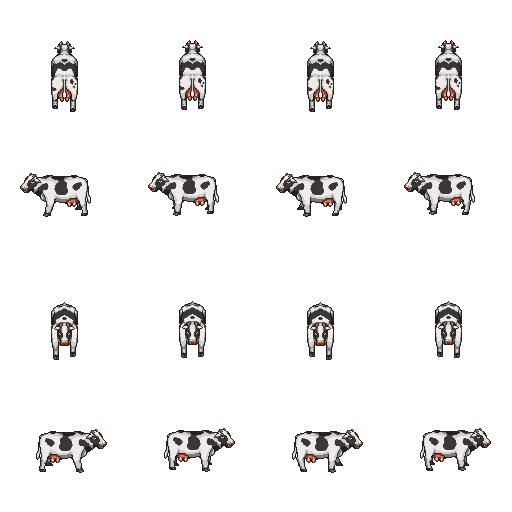 What would be cool is if someone could take some time and do a couple of color variations of the Cow. Daneeklu has done a majority of the work and maybe someone on OGA can expland that? Yes, I have planned to make both a pig and a sheep. 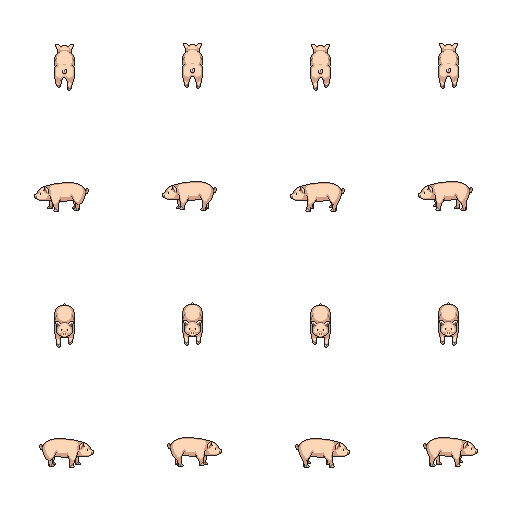 So far, I've started on the pig and I hope I'll get around to finish and upload soon enough. Any recolors would be nice, and let me know if you modify the animals and want the derived works in this same submission. Note that I recently changed the license of this submission to CC-BY 3.0 (or later) / GNU GPL 2 (or later), to allow for more uses. 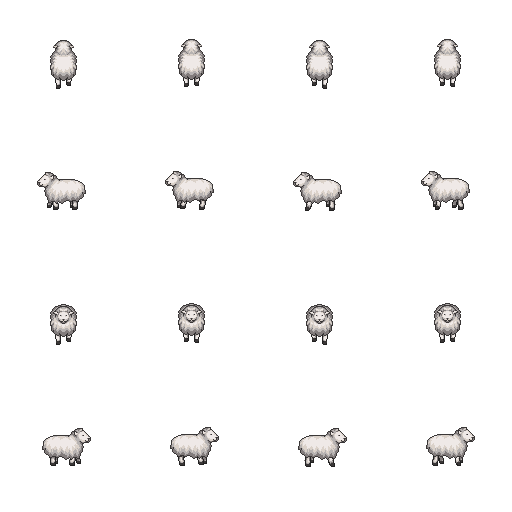 I have now added pig and sheep to the animals. That means this set is hopefully complete, unless there needs to be done some minor corrections or something. These are great. So if i use these in my game i just need to put your name in the credits and a link to this work? just asking to save on any copy right issues if and when i release my game. Something like that; you should check the actual license to see what applies. Probably you need to put the license text somewhere for the users to see. But yeah, the idea of the CC-BY license is that you can use stuff as long as you give attribution (check license for details). 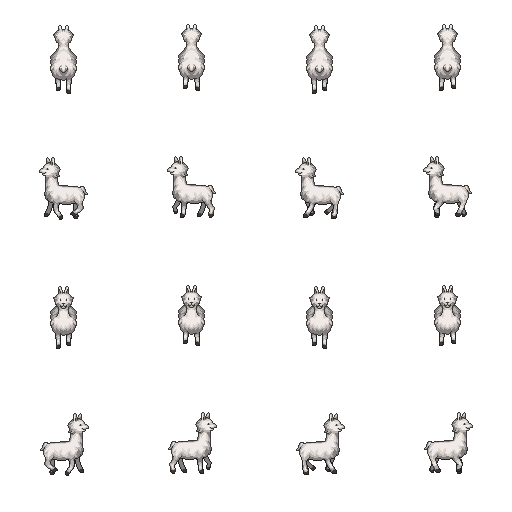 Hello, is it possible for my Studio to buy your Llama Sprite? I would like to discuss a price, and also, if you're the one that did this, I wonder if you could make an Updated version, I am ready to pay and get a Copyright on it, this is serious, reply me if you are interested, have a good day! 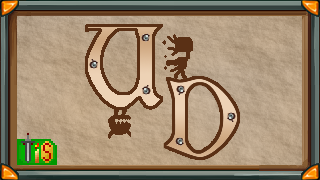 I used this in my android game UpsideDown. Please check it out on play store. All the attributions are in Credits section. I love this set! I could make a whole game out of this ! Great! This is just what I needed for my project! Thank you! 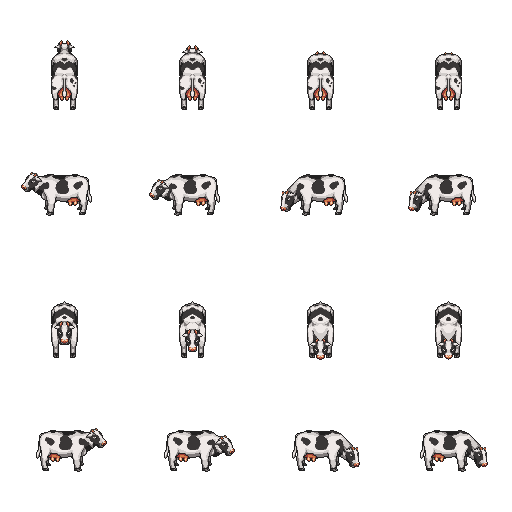 I used paint.net to downsample them (and place them in appropriate position) because I want to use them as a cool GBA game asset, for I want to make a random game. I will include the downsamplings. They are made to divisible by 8, and no pixel padding between images (tightly packed). These ones aren't edited to look good, just downsamples. Also, all rights are owned by the daneeklu (as he created it). Great work, can you also add other animals! Reworking the pig for use in Stendhal. Thank you! Thanks for producing great artwork!